Product Consists : Axe Peacemaker Shower Gel (Weight : 250 ml ), Axe Apollo Deodorants (Weight : 150 ml), Marks & Spencer Floral Collection Iris Florentina Soap (Weight : 100 Gms) along with One Container of Non toxic herbal scented holi color (Weight : 50 Gms). Make your receipient have the most blessed holi festival year than he/she ever had. May it be full of fun, joy and love. 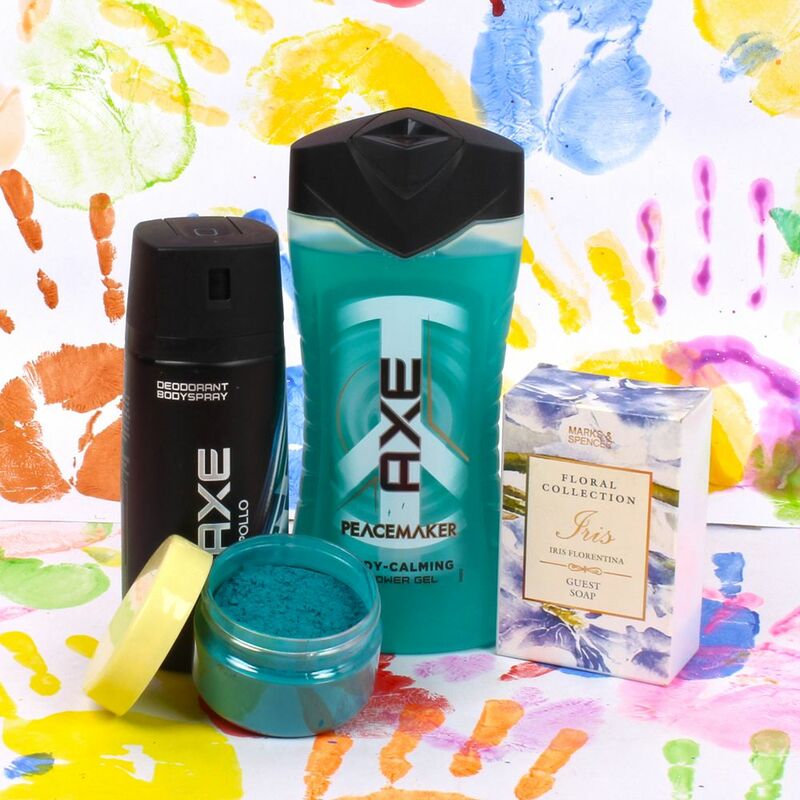 Sending this Axe Holi Gift Set For Male is believed to bring happiness and prosperity in your receiver's life. 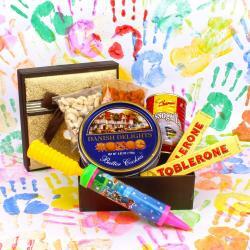 Wish good luck and success with this gift items to your dear ones. Sometimes you will never know the value of a moment until It becomes a memory. We send Herbal Gulal which is made from natural ingredients that does not harm our skin. The Gulal consists of colors as well as glitters which add up to the colorful celebration. Shower your love to your loved ones with colors of happiness and joy as you surprise her or him with this gift hamper on Holi. 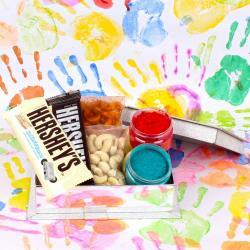 An ideal way to make their Holi fun-filled and memorable. Colours are the most joyous part of the Holi celebrations. They add life and vitality to the festival making it most vibrant of all. The best option would be to play with natural home made colours. 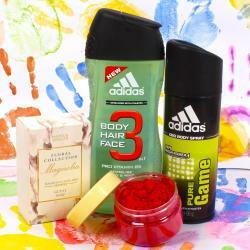 Your skin will feel tampered with the use of skin friendly natural products like this hamper. This combo is presented as gift to any one. Fill the special day of your loved ones with lots of sweetness and brightness. 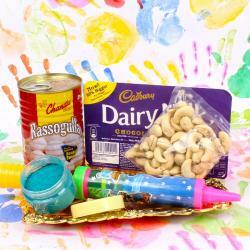 Surprise them with this beautiful holi gift hamper. Browse your favorite products, it is very conveniently available for online shopping from anywhere in India with Free Shipping. Product Includes : Axe Peacemaker Shower Gel (Weight : 250 ml ), Axe Apollo Deodorants (Weight : 150 ml), Marks & Spencer Floral Collection Iris Florentina Soap (Weight : 100 Gms) along with One Container of Non toxic herbal scented holi color (Weight : 50 Gms).